Product information "HAIX Black Eagle Safety 50 Low"
Like all of HAIX’s Workwear Collection, the HAIX Black Eagle Safety 50 Low provides highly impressive safety features. Made of fibre-reinforced leather, it fulfils the requirements of Safety Class S3 as well as being both highly breathable and watertight. A protective toe cap at the tip of the shoe prevents any injury from falling objects. It is also puncture resistant. The Black Eagle Safety is ESD-compliant between 7.5 x 105 ohms and 3.5 x 107 ohms. This means that it meets the ESD Standard DIN EN 61340-4-3 (Climate Class 1) and all relevant antistatic requirements. Such protection is indispensable in areas where you are working with highly sensitive electronic components, such as production facilities. This is a functional shoe which is suitable for all occupations in which long periods of standing are required, such as industrial workers, tradesmen of every kind and staff in the food industry. It will prevent injury and help to reduce any strain on your joints and spine. Work shoes are worn regularly and for long periods. For this reason, it is important that safety footwear offers a good fit. It must not slip or create pressure points. Three different insoles mean that the HAIX Black Eagle Safety 50 Low can be perfectly adjusted to fit, regardless of whether you have narrow or wide feet. The insole also supports your feet as you walk along. A layer of PU foam in the heel area cushions your steps and gives an impression of walking on cotton wool. The HAIX Black Eagle Safety 50 Low is completely metal free. This makes it considerably lighter than work shoes that have a steel toe cap, for example. The HAIX Black Eagle Safety 50 Low is suitable for any weather conditions and can equally be worn either indoors or outside. This makes it an ideal option for both factory workers and builders. A three-ply GORE-TEX® membrane keeps the water away when it rains. The leather used in the manufacture of the Black Eagle Safety 50 Low has been hydrophobised and thus rendered water repellent. The GORE-TEX® membrane also protects your feet against the heat by making the shoe highly breathable. The fine pores contained within the membrane allow moisture to evaporate and be expelled. At the same time, a fast-drying inlay also helps absorb sweat. This can even be removed and washed as and when necessary. Your feet will not sweat unnecessary in warm industrial facilities or outside in the hot sun. Special pigments have also been integrated into the leather to prevent any unnecessary overheating. These reflect the sunlight and automatically mean that less warmth will be transported to your feet. 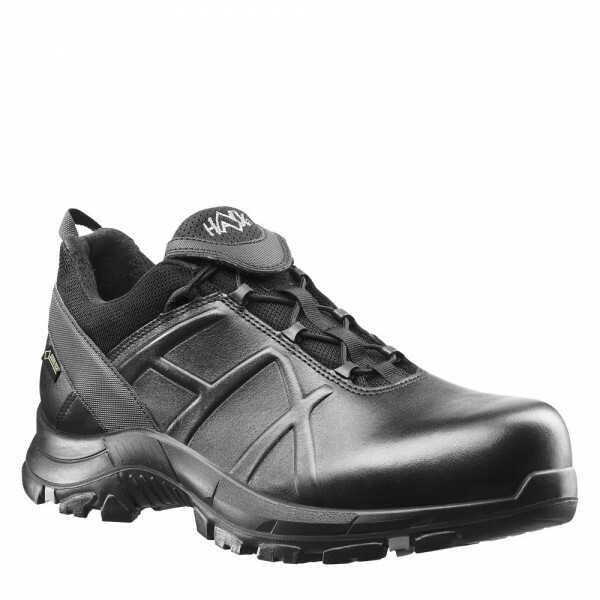 The HAIX Black Eagle Safety 50 Low is manufactured in highly resistant waterproof leather. Pigments in this material reflect the sun’s rays and thus ensure that less heat is transported to your feet. A rapid fastening system allows you to save valuable seconds. Instead of having to go to the trouble of tying a knot and bow, you simply fasten the laces via a plastic clip. The ends of the laces themselves are tucked into a special practical pocket and cannot therefore catch on any objects as you walk along. A three-ply GORE-TEX® membrane ensures that the Black Eagle Safety 50 Low is both watertight and highly breathable. The inner lining of the shoe is made of abrasion-resistant fabric to provide comfort in summer and winter alike. A fast-drying insole immediately absorbs sweat. You also have a choice of three different HAIX inlay soles. This means that the shoe can be perfectly adjusted to suit the width of your feet. The Black Eagle Safety 50 Low is shipped with the red inlay (medium) as standard. Additional Vario Fit inlay soles can be ordered. The HAIX Black Eagle Safety 50 Low is completely metal fre and is thus particularly light in weight. The sole of the Black Eagle Safety 50 Low is manufactured in a durable and extremely slip-resistant rubber compound. It is also puncture resistant to protect you against sharp articles underfoot such as stones and nails. Liquids such as oil and petrol are unable to penetrate. At the same time, the sole provides outstanding insulation against heat and cold. It is also colour fast and will not leave any dark marks on light-coloured industrial floors or tiles. Tradesmen and industrial workers need safe and comfortable work clothing, and the same applies to their footwear. The HAIX Black Eagle Safety 50 Low is a highly functional option which can be individually adjusted to the width of your feet. It will protect your toes against impacts and reduce the pressure on your joints. Try out your new HAIX safety shoes now.